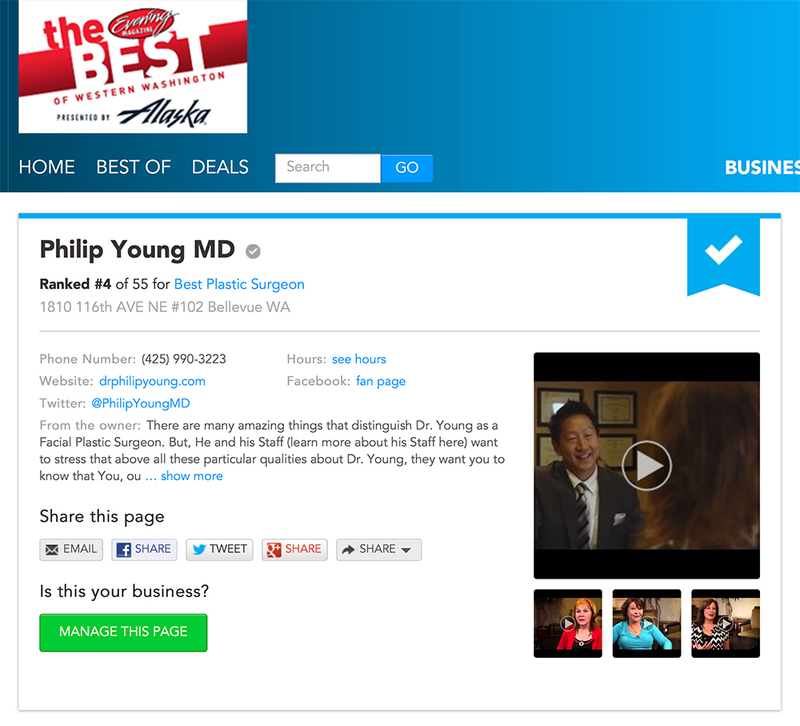 Voted Best Plastic Surgeon for Western Washington 2014: Seattle | Bellevue’s Dr. Philip Young of Aesthetic Facial Plastic Surgery is a Top 5 finisher! We are so happy to announce that we were voted Best Plastic Surgeon for Seattle Bellevue Western Washington 2014 and finished in the Top 5. Dr. Philip Young and his Team here at Aesthetic Facial Plastic Surgery Live and Breath the work we do. We are constantly meeting and discussing how to improve the care of our clients. I absolutely think Dr. Young is a fabulous doctor and does excellent care for his patients. Being born a man I was always unhappy with the way my face looked. Every time I looked in a mirror I would see the same unhappy little boy. Lived most my life this way. Until I finally had the courage to get face surgery done. I found Dr.Young online and I’ve read that he had experience with male to female transexuals.This was my deal breaker. And so I set up a consultation. And been happy and confident ever since. Dr.Young did a fantastic job and always made sure I had no complications post surgery. He also gave me his contact info to get ahold of him if I had any problems,questions or concerns after my surgery. Which he always found the time to respond back promptly. This is just one of the many ways him and his staff made me feel so special and well cared for. They never judged me, but welcomed me with open arms and the biggest smiles ever,every time I came into the office. I highly recommend Dr.Young and his AMAZING staff. They really felt like my family when my family wasn’t there to support me. Dr.Philip Young is truly God send. He is dedicated to his patients and even replied back to me late one evening on his own time. How many Doctor’s do that? He is an exceptionally talented and skilled Surgeon who also listens very well and has excellent intuition. He has the best bedside manner and I am so grateful to God that I found him. I am slowly saving to get some botox and possibly fillers! I’ve heard nothing but wonderful things! Thanks to Dr. Philip Young . . . I look 10-15 years younger than people my age! All natural! Healthy & Fresh! Awesome, welcoming service of the staff. I can’t but admire Dr Young, would recommend him to everybody without a doubt; he is a processional who works hard and loves what he does; he helps us to look amazing, feel great and impress the most..
been going to him for 10 years , he’s the best……my face looks great, thanks to him. He takes his time to talk and explain things to you! I love Dr. Young! He does my Dysport and Restalyne and has for a few years. Everyone compliments my lips. Little do they know – I get them done! No duck lips. They are soft and perfect. think Dr. Young is great. Very personable, listens well to patient’s concerns and addresses them in a competent and friendly manner. Dr. Young performed a minor surgery on me and was professional and helpful from start to finish. My next enhancement will definitely be from him! He is the best ! The Best! I can hardly wait to get my eye injections. But want permanent fat injections in my eyes and I trust this office. I could go to any plastic surgeon in Beverly Hills as my daughter lives in California. But I choose Dr. Young. he truly cares about his patients ,I vote for MR Young his amazing and simply the best in the state of Wa God bless you. Dr. Young is professional, knowledgeable, always happy, and enjoyable to talk with. Abosolutely the best surgeon with an outstanding staff. If you want the best surgeon in Seattle, go visit Dr. Young. He is caring, understanding, knowledgable, and compassionate person. He actual check up on his patients during his personal time off. I highly recommend Dr. Young to anyone. He’s so compassionate and caring. He’s an incredible doctor and I’ve had great results! Great credentials, experience, and skill. With results that look natural and healthy. Dr.Young is awesome. He provides a comfortable yet confident environment and will do whatever he thinks is best for his patients. I recommend him over any other doctor in Seattle. Personable, conservative, careful. Dr. Young makes sure you look refreshed and not ridiculous! He’s treats you with respect and has great listening skills. the one and only person i would trust!!! I’ve never met a plastic surgeon who cares more for his patients!!! the best and only the best!!! dr young is the best surgeon in Bellevue, WA. I would highly recommend visiting his office for improving your appearance. This is the only office to choose! I’ve referred many clients to Dr. Young & have heard nothing but positive reviews. Truly a brilliant surgeon, caring, compassionate, artistic. He is a surgeon’s surgeon. Dr. Young is a caring professional with impeccable talent. Great honest doctor who gives great care and concern to his patients. Highly recommend him! When you want the best you have to go to the best. Settle for no less than Dr. Young! The best is in Bellevue…of course! I’ve twice experience his perfection and amazing competence. What a gift to his patients! Great Doctor makes you feel involve and like a team not just one sided. Great listener. Dr. Young is the BEST!!! MADE ME BEAUTIFUL! THANKS DOCTOR! Phil has a heart of gold and undeniable talent.